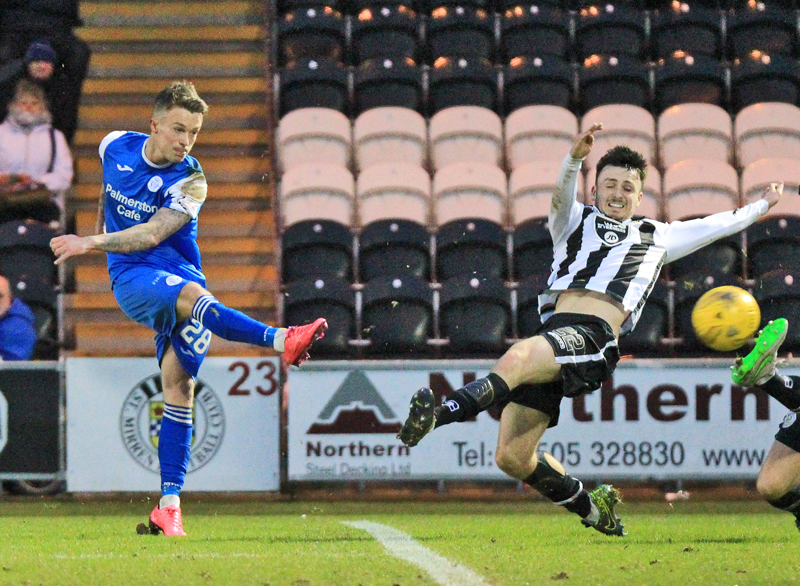 Queens` supporters are used to celebrating when they hear Stevie Mallan has scored, but today was not the case as the ex-Queens strikers son`s free-kick was the difference at the Paisley 2021 Stadium. A superb first half free-kick from Stevie Mallan secured all three points for the Buddies as they continue to move up the Championship table and look towards the play-off hunt. In a game that either side could have scored a barrow load of goals, James Fowler`s men will be disappointed to not come away from Paisley with at least a point after Jake Pickard missed a couple of second half chances and Ryan Conroy clipped the bar with a free-kick. This game was originally meant to be played on December 5 but fell to the weather and today`s match was the first half of a double header with next weeks fixture in Dumfries. 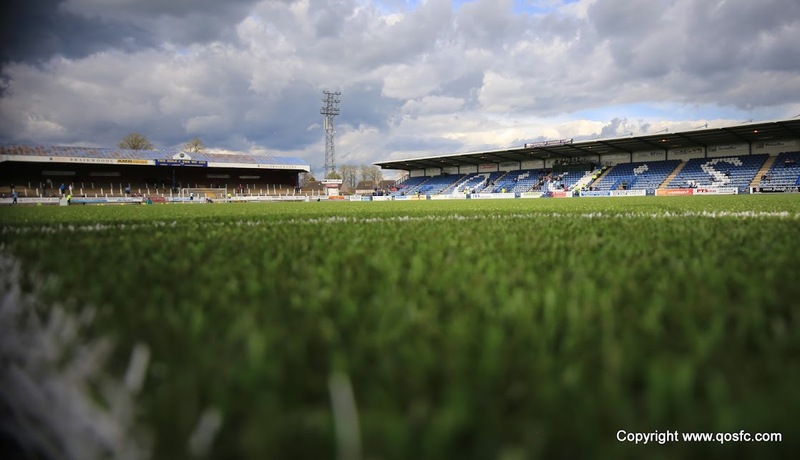 The Doonhamers were unchanged from their 1-0 victory against Alloa Athletic two weeks ago and were facing a side who had just won their first home match since May 2015 and Alex Rae has added experience to their squad in the transfer window. 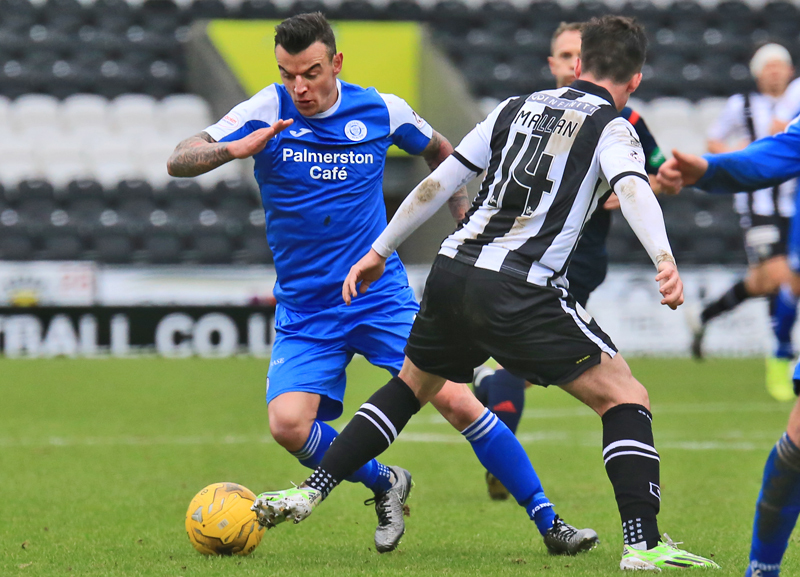 Ex-Queens midfielder Rocco Quinn, striker David Clarkson and right back Gary Irvine were recruited to the Saints team that have been underperforming this season. The hosts started the brightest as the pace of midfielder Alex Cooper was causing Lewis Kidd problems early on but it was The Doonhamers who had the first chance to take the lead in the 9th minute. Mark Millar`s corner kick found Pickard in the box and his header was kept out by a combination of Buddies goalkeeper Jamie Langfield and the woodwork before falling to Derek Lyle but the veteran`s shot hit the side netting. 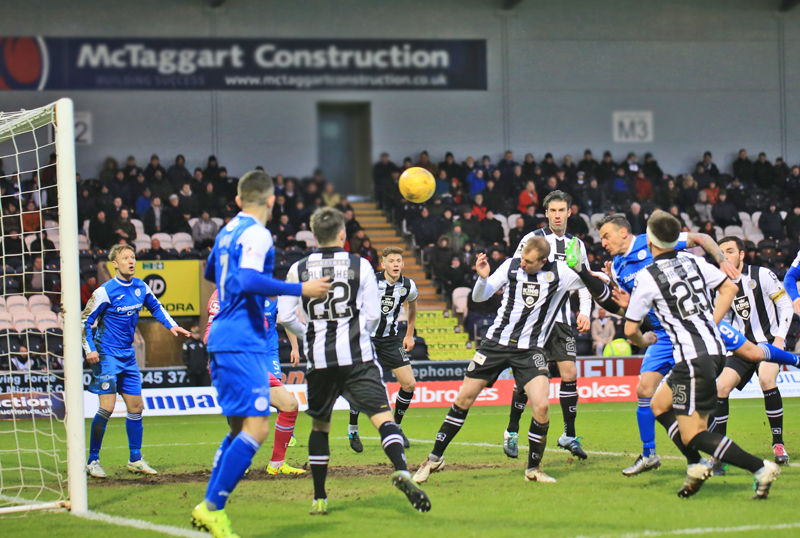 It was an exciting start to the match and another close range effort was missed, this time by St Mirren`s captain Andy Webster. The centre back was unable to force the ball into the back of the net from close range after a mix-up in the Queens box and his tame effort was easily collected by Robbie Thomson. The Saints had a lucky escape as Alex Harris beat Gary Irvine to the ball on the right wing, and his fine cross was only inches away for Derek Lyle to pounce on. It was an open match with both sides not holding back and desperate to find the opener and the mobility of wingers Harris and Russell causing the Saints defence problems. Queens nearly found that all important goal in the 18th minute as Lewis Kidd`s fine delivery from the right hand side found Iain Russell but his volley flew wide of Langfield`s goal. Alex Rae was forced into an early change as captain Webster limped off the field and was replaced by Sean Kelly, who opened the scoring in our last meeting at Palmerston in September. Queens were punished for not putting away their early chances in the 25th minute as a moment of brilliance broke the deadlock. Jordan Marshall fouled Gallagher 20 yards from goal and Mallan stepped up to take the free-kick and curled his effort past Robbie Thomson and into the top left hand corner of the net. The Doonhamers would feel hard done by going behind in a match where they had been creating promising chances but the goal changed the first half as the home side began to dominate possession and look to extend their lead going into the break. 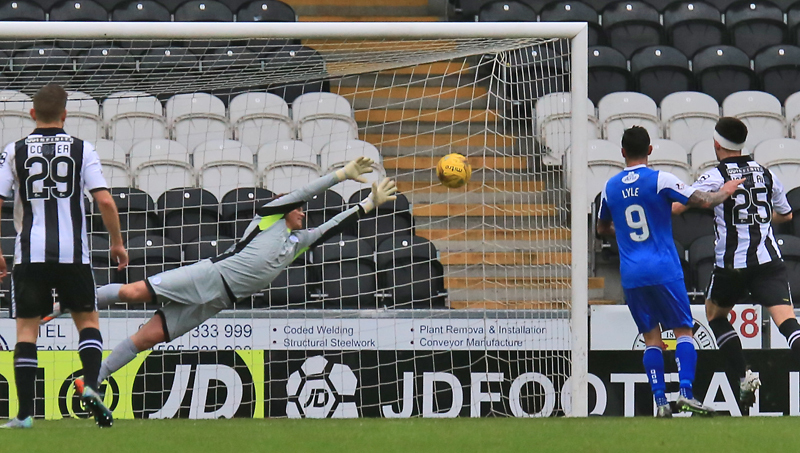 The Buddies broke forward and Lawrence Shankland missed an open goal after good work from on-loan striker David Clarkson. Shankland`s blushes were spared as referee Crawford Allan had already stopped play for a foul on Robbie Thomson. The Queens keeper was again in the spotlight as he was cautioned for handling the ball outside the penalty box, much to the anger of the home support who thought Thomson should have been given his marching orders from Allan. The goal had put the Saints into the driving seat and they began to look more of a threat in the final third. Clarkson and Shankland were only whiskers away from connecting onto an inviting cross from Mallan in the 39th minute to double the hosts lead. Despite the home side looking more confident, The Doonhamers had their chances to go in level at half-time. Jake Pickard, who was in more of an attacking role today, leaped onto a ball from Kidd but his effort lacked power and was easily gathered by Langfield. Seconds later it was Russell`s turn to be frustrated by the former Aberdeen goal keeper as his swinging shot from 20-yards was parried by the full stretch Langfield and cleared by the defence. It was a game with a few meaty challenges and Russell was deemed to have fouled Mallan and was shown a yellow card for his late challenge. The booking was the last action of an eventful first half where Queens had their chances to be ahead early on but a moment of brilliance from Stephen Mallan separating the sides at the break. The second half was only three minutes old when referee Crawford Allan was called into action as Keith Watson was booked for a late challenge on Russell. The free-kick was wasted though as Mark Millar overhit the ball out for a goal kick. Alex Rae`s side almost doubled their lead as good link up play from Clarkson and Shankland fed Cooper out wide and he pulled the back to Mallan and the midfielder tried to curl his effort across Robbie Thomson into the far corner but the ball drifted inches wide of the post. Almost immediately The Doonhamers had three back-to-back chances to grab an equaliser. Millar picked out Pickard with a pinpoint cross and his header looked destined to go in but was blocked on the line by Gallagher. Seconds later, Harris pinged in a cross which found Pickard again and this time his header was superbly tipped over by Langfield to deny the youngster. From the resulting corner, Millar`s cross was headed wide by Queens joint top goal scorer Lyle. Three wonderful opportunities to get back on level terms may have gone by but it was an encouraging opening fifteen minutes of the second half as the St Mirren defence were looking nervy and making errors they weren`t in the first half. The home side who had only won one home game this season tried to spring back into life and Shankland nearly eased the pressure with a second goal but his shot flew over the bar. The Saints had another chance to put the game to bed but after an almighty scramble in the Queens penalty area, Clarkson shot was comfortably saved by Thomson. Fowler made his first changes of the afternoon as Ryan Conroy replaced the booked Iain Russell and Gary Oliver replacing Harris on the right hand side of midfield. The changes almost instantly got Queens on level terms as Oliver was fouled just outside the edge of the box, giving Queens a free-kick in a great position. Conroy lined up his free-kick 20 yards out and his effort rattled the bar and sped behind for a goal kick. Queens final throw of the dice saw Kidd replaced by young striker Aidan Smith and the Buddies made their remaining changes, Steven Thomson and Cameron Howieson on for Shankland and Cooper. It was Thompson`s introduction that inspired a breakaway for the home side as he set up Mallan at the edge of the box, his shot being tipped over by Queens number one Thomson. It was another sub who almost drew the visitors level, Oliver managing to get past Kelly and tested Langfield with a low shot from distance but the keeper parried away his effort. It was a nervous end for the majority of the 2,706 at the Paisley 2021 Stadium as they hadn`t seen back-to-back victories at home since the early months of 2015 but they were relieved when Crawford Allan blew for the full time whistle. The Doonhamers will feel hard done by for not at least getting a point from Paisley and on another day they could have walked out comfortable winners. James Fowler`s men have a chance to get their revenge on Saturday when we host the Buddies at Palmerston Park. 14:26 St Mirren XI; Langfield, Irvine, Webster, Gallagher, Quinn, Mallan, Clarkson, Watson, Cooper, Shankland, Baird. 14:38 Queens are unchanged from their victory two weeks ago. A point for Queens today would see the Doonhamers move into the play-offs. 11 min Chance for Queens to take the lead but Langfield tips an effort onto the post and Lyle`s rebound hits the side netting. 20 min Very open game so far. Russell and Lyle with half chances for Queens A chance for the home side as Webster misses from close range. 26 min A superb free-kick from Mallan gives the home side the lead. 33 min Thomson deemed to handle the ball outside the box. 35 min Pickard shot from just outside the box easily saved by Langfield. 54 min Pickard`s close range header blocked by Watson. Much better from Queens. 54 min Harris cross finds Pickard again and his header is superbly saved by Langfield. 55 min Another chance for Queens. Millars corner finds Lyle at the front post but he can`t get his effort on target. 76 min Conroy`s free-kick rattles off of the bar and out for a goal kick. 81 min Attendance today 2,706. 87 min Oliver shot is saved by Langfield.